I was up in New York recently, and saw a video production unit filming in the lobby of my hotel. 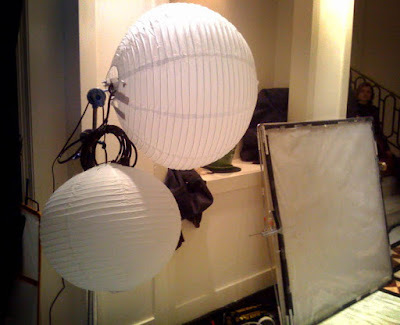 They were using cheap paper lanterns as light modifiers for their point-source continuous lights. Very cool thinking, IMO. You'll need to get your speedlight into bare bulb mode first, because you want that light radiating in all directions to get the benefit. But the beauty of this is that because everything is so light you can do it without a stand or boom. You can easily use this as a soft, wide, overhead light by using a small piece of cord to suspend a slaved (or PW'd, etc.) speedlight from an overhead fixture. By using a tiny A-clamp (or piece of tape) you could suspend the flash right down into the lantern, and have everything in turn suspended by the cord that is holding up the flash. My friend Drew Gardner uses a much more expensive commercial version of this kind of light, and tells me that to make them really useful, you'll want to have a "skirt" at your disposal. This can gobo the light in any direction right at the source. Two dollars worth of black, rip-stop nylon cut to shape ought to fit the bill nicely. I know the lanterns are available very cheaply at Ikea. But you can also get them for next to nothing online, here. Bear in mind that the "natural" colored lanterns (as opposed to white) are going to warm the daylight balance of your flash some -- at least a 1/4 CTO equivalent. But that could be a good thing for shooting people. My guess is that even the white ones will warm it up a tad, too. Is anyone already using these things? If so, how's it working out for ya? What about Euro sources? Hit us in the comments.